Isometric Breathing is THE MOST important practice you can bring into your day. You can stop eating, even stop drinking water for a number of days, but you can’t stop breathing for more than a few minutes. Breathing is THE most fundamental function of the human body. Breathing literally gives us life, from biblical references to modern science breathing is the most important thing we will ever do….yet how many of us even pay attention to how we breathe….? In this article I am going to share with you one of my core teachings and key techniques, a method of power generation that nourishes every cell of your body - Isometric breathing! Isometric Breathing is the VERY FIRST thing I teach in my 7 Seconds to a Perfect Body Program and the reason is simple - the truth is not that many of us breath correctly. Most people don;t think twice about the breath and even when we do we probably don’t assign it much importance. Far too often we breathe quite shallowly, only from our chests, rarely expanding our lungs or their full capacity, rarely using the muscles of inspiration and expiration. We let stagnant air settle in the bottom of our lungs, and cheat ourselves of life giving and life enriching oxygen. And this causes weakness and ill health. As many of you may be aware I also run a busy medical practice specializing in Traditional Chinese Medicine and Acupuncture – everyday I see patients who fail to breathe in correctly and as such weaken themselves, their muscles, their energy levels, their immune system and more. In the gym, I see countless guys lifting weights with awful form huffing and puffing, growling and groaning without understanding. They do so because they think they will draw more attention to themselves – few understand the power of breathing, let alone isometric breathing. The power of breathing is certainly something I learnt early on. During my early years training in the martial arts I was taught again and again, that more than technique, more than strength, my breathing controlled how much power I was able to summon, how quickly I could strike. In the Japanese arts, such as I studied there is concept called “KIAI” – it means “spirit shout” and it represents the meeting of the physical body and the spiritual mental intention. Delivering a blow timed with proper KIAI is near unstoppable, the force of which can shatter a man’s sternum. From the spiritual arts of India, to Christian prayer and from the martial arts of the east to modern science breathing is the foremost focus of power. Below I will share with you the first Isometric breathing technique in my 7 Seconds to a Perfect Body Program. This is the secret of breathing and how you can literally breathe size and strength into any muscle – and specifically how your breathing controls the size of your waist line and the strength and definition of your abs. This is the very first exercise I teach anyone. Why? Because mastery of this one skill, aside form developing a tight toned waist line, simultaneously builds the connection between mind and muscle that allows you to develop peak muscular contraction, and therefore incredible results. You can perform this either standing up or lying down. Lying down often helps when first learning this technique as you will be able to feel how your body moves with greater ease, so we will start from there. Lie down with your back on the floor and let your arms relax palms flat down by your sides. Inhale deeply through your nose and take in that pure air all the way down to your stomach. (An easy way to see if you’re doing this right is to place something, say a shoe on your stomach and watch it rise upwards). Once you can’t breathe in any more tense the muscles of your stomach and pull the muscles inwards. Hold that tension as you slowly exhale. As you breathe outwards squeeze your abs inwards as tightly as possible while making a “sssssss” or “ffffff” sound. Keeping the abs area as hard as possible (they should be shaking) and slowly breath in over 3-4 seconds. Without relaxing the muscles perform this deep breathing exercise 10 times. You can practice isometric breathing any time you like, but I highly recommend doing so 1st thing in the morning before you get out of bed. Then any time you wish to re-energize yourself and increase you mental clarity feel free to practice this again. This breathing technique is the MOST IMPORTANT aspect of isometrics. Breathing into your muscles increases blood and oxygen supplies, which in turn makes them bigger and stronger. This is most evident when applied to muscles such as the pectorals (chest) and biceps. Using this technique it is easily possible to add over an inch to your arms alone within a few minutes solely as a result of blood volume increase in the capillaries. 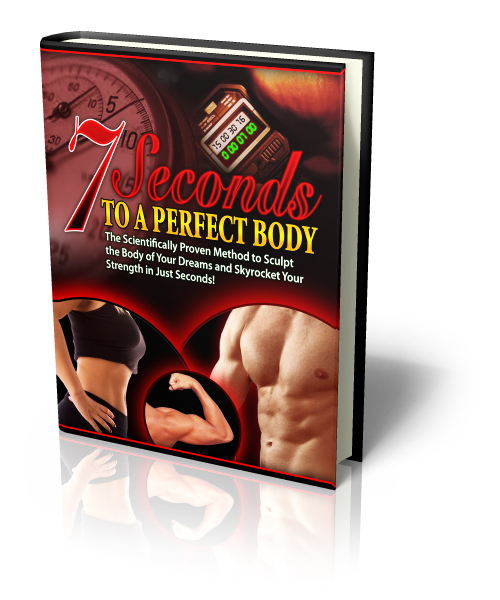 Which you can read about in 7 Seconds to a Perfect Body.